We have a bug out that’s in the woods. Only about an acre is open, the rest are full of pines and assorted hardwoods. Because of this our winter preparedness is based around wood as our fuel for warmth and cooking. I have a nice 18” chainsaw that is near and dear to my heart but if we were in a grid down scenario chainsaws require gas and are loud, drawing attention to yourself. Because of this I see axes as an important part of our preps. At a basic level you can get by with one axe and the Husqvarna multipurpose axe may be that solution but if you live in the woods in my opinion you should have three axes and maybe four. First is a hatchet, a small one handed axe for prepping kindling and prepping for a fire. 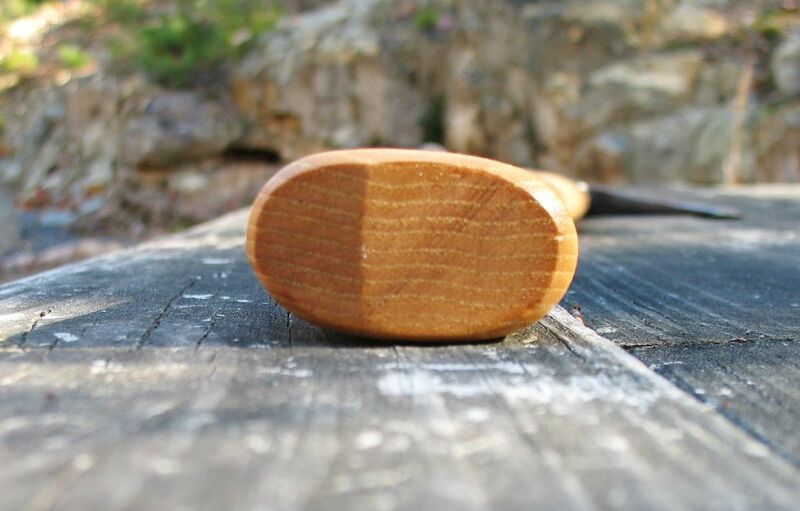 Next on the list is a small forest axe, also known as a house axe. This could replace the hatchet if you only wanted three. All this is, is a hatchet sized head in an 18”-20” inch handle. This allows you to get two hands on the handle. You can split wood, prep kindling, take limbs and branches off of fallen trees, and can fell small trees. This is a great axe to have around the house and if you were going to carry an axe for hunting or camping this is the size I would take. Large enough to get most of the work done but small enough to not get in the way. It should be made of good steel and be able to throw sparks. It should also be sharp enough to use as a knife if needed for starting a fire, processing game, or making notches and tools around camp. Third is a forest axe. 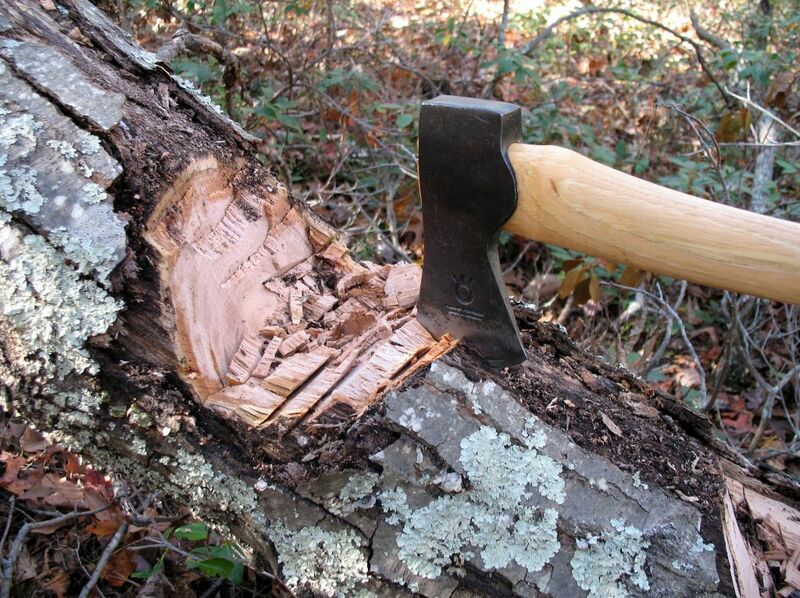 This is an axe that is large enough to fell trees but small enough and have a light enough head to do small tasks. Generally the handle length is around 24”-28” You can split wood but also make fire sticks. You should not really have a problem taking down small trees with this axe. If you live in a heavy wooded environment this would be your go to axe around the house. Forth is a felling axe. This is your chainsaw. The head of this axe is on the heavy side; anywhere from 3 to 5 pounds. And the handle is generally over 30”. The weight of the head and the longer handle make chopping down a full size oak much easier. I will do a separate post on these and how you can save yourself a bunch of money finding old axe heads and rehanging them. I have all four but as I mentioned the house axe can replace the hatchet if you wanted. We have a hatchet. It’s kind of piece of crap, I think I paid $7 for it but it holds a good edge and all I every use it for is processing kindling and mostly lives inside by the wood stove. This point is important. Your axes should not live inside. It is far too dry in your house especially in the winter for an axe. The handle will shrink and your head will come loose. Because of this, my POS hatchet has always lived inside and has a synthetic handle. Getting back to the purpose of the post, let’s talk about steel. So we (USA) used to make the best steel money could buy and used to make some of the best axes money could buy. Those days are long gone. Now days if you want a good axe you need to get a Swedish hand forged axe from Gransfors Burks, Wetterlings, or Hultafors Burks. All will cost you well over $100 and up depending on the axe. That brings us to Husqvarna, the chainsaw company. They outsource their axes and just stamp the handle. They used to be made by Wetterlings and now are being made by Hultafors Burks, both excellent manufactures. 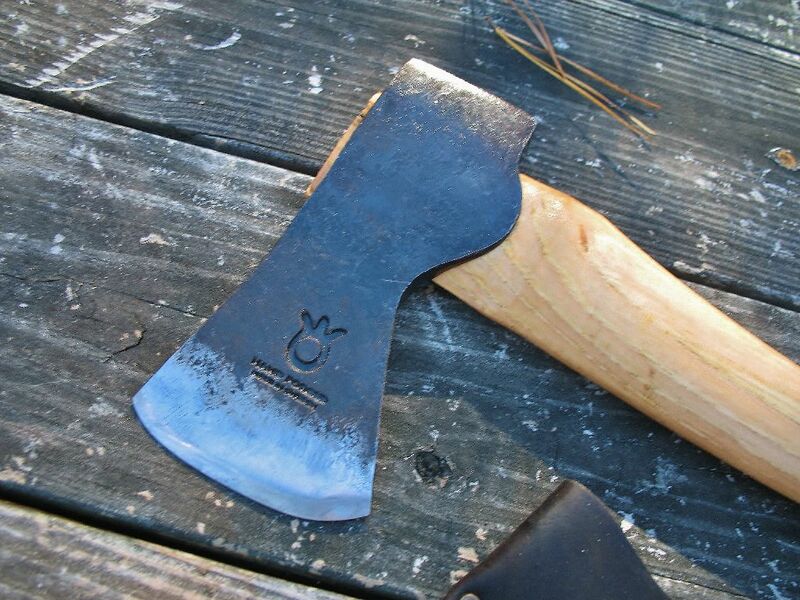 Hultafors Burks has been making axes in Sweden since 1697. Not really a brand known in the US because they have been lacking a distributor but that has changed as of recently. 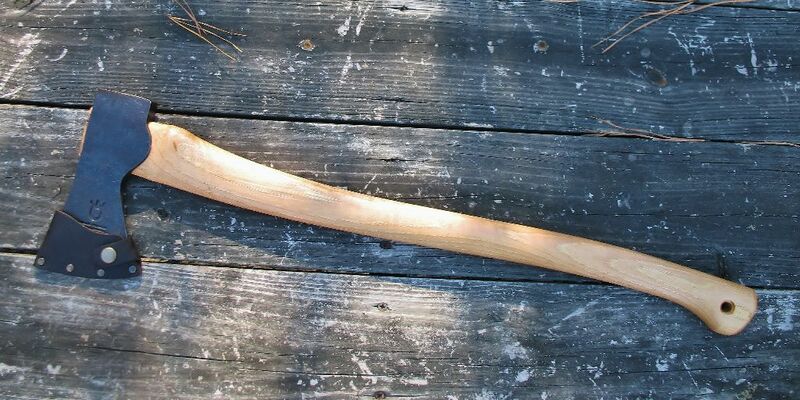 Hultafors makes a felling axe that has a 26” handle that runs about $165. Hultafors makes the same axe for Husqvarna. It uses the same head and same handle but with less finishing and sells for $65. So what does less finishing mean, they don’t put a razors edge on it and they don’t polish the exposed metal as much as the Hultafors version. The handles also seem to a lesser quality but still US hickory and mine had excellent grain orientation. What’s all this mean? If you need a good multipurpose axe but don’t want to shell out the cash for the Swedish manufactures buy the Husqvarna and learn how to sharpen an axe. You will save yourself at least $60 and will know your axe inside and out. I ordered mine from Amazon and when I got it in the mail I thought it was going to be bigger as its light and handy. After using it for most of the early season prepping the house for winter I am blown away with the quality and edge retention. The Husqvarna has a 26” curved handle and is designed to be a multipurpose Axe. The length of the handle is about the length of your arm. It’s a very handy axe that is light enough that you can carry it around all day. The head weighs about 2 ½ lbs and can be honed to be razor sharp. Buts what’s amazing is after you get it that sharp it will hold its edge for a long time. I put in about a half hour sharpening the Husqvarna and did some testing and she was still razor sharp after 20 cuts in the a dead oak. The Husqvarna multipurpose Axe comes with a great blade mask of soft leather. A little on the big side but will do the job well. Out of the box all she needs is a little boiled linseed oil on the handle and a reworking of the blade with a Lansky puck. The blade gets scary sharp very fast and as I mentioned, the steel has excellent edge retention. For the price it seems very much just like any old axe that you would get at the hardware store but after you put a good edge on it, and use it for a while, you see the true beast of what you own. The quality is outstanding for the price. Taken care of this can easily be passed down to your kids. I think this is the best deal in axes. If you are looking for a multipurpose axe that can fell a small trees, easily lim fallen trees but also split wood around camp for the money I think the Husqvarna multipurpose axe can’t be beat. I may buy another and rehang it on a smaller handle.